Last week we looked at a collection of Seoul DJs who had created remixes of SHINee’s Everybody. Today we aren’t venturing too far from SM Entertainment, as we look at one of the SM C&C labels, Woollim Entertainment. Woollim’s hip hop producer / DJ duo Rphabet, pronounced just like Alphabet, are Holmes/Bee and Mr.Rupin/Razer. Rphabet have only been with the company for a few months, though the tracks you can attribute to the writing and production team goes back over three years. RAINBOW’s I’ll Wait For You. Bee also collaborates as a vocalist from time to time, more than once he’s worked with San E and with the likes of M.I.B’s 5zic on the Most Incredible Busters album. Though their notable recent tracks may be the title tracks created for Woollim artists. The entirety of TASTY’s debut EP Spectrum was written, composed, arranged and produced by the duo. INFINITE’s Destiny was written and produced by Rphabet. 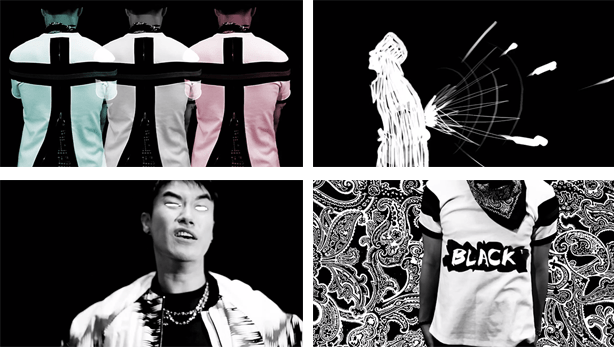 In October Rphabet teamed up with rapper San E to collaboratively write and produce the piece Black Suit, their first official release as an independent artist. In response to their directional change a Woollim representative explained that the team would continue as writers and producers though roll out their own music. Their new direction was described as being similar to Calvin Harris’ work as a pop producer who also releases his own music as a DJ. Black Suit is incredibly clever both in lyrics and visual, contain much food for thought. The visuals reflect the lyrics, with references to work by San and Rphabet, religion, twitter, the alphabet, rap skill, and genre competitors. I’d certainly recommend you watch Black Suit a couple of times to really take in the detail. Loenent have English captions if you want a translation too, just to really see how clever this is! Do you have a favourite track created by Rphabet? Is their hip hop music as good as their Kpop?